Today, when you order "Bicycle 100% Plastic Cardss", you'll instantly be emailed a Penguin Magic gift certificate. You can spend it on anything you like at Penguin, just like cash. Just complete your order as normal, and within seconds you'll get an email with your gift certificate. 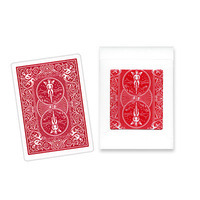 Durable, Washable Plastic Playing Cards. Each deck has more that 50 hours of continuous play! These bicycle backed cards are 100% Plastic and are officially printed by the U.S. Playing Card Company. 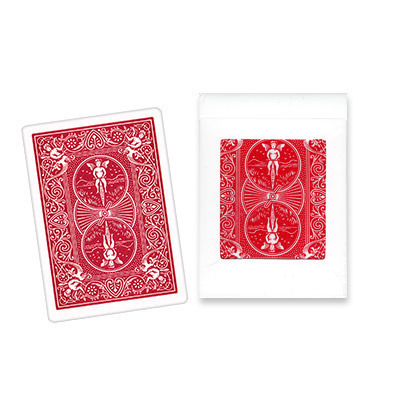 They can be used in any number of card routines. Plastic cards spring back to their original flatness and are very hard to mark or crease. Get more mileage out of these playing cards than a standard deck. Note: These decks are available in Red and Blue. Unfortunately, choice of color received is not available. Brilliant cards! Perfect for Laura London's Card in Bottle. Very high quality cards. These are definitly not good for fanning and flourishes. But some effects require plastic cards and these are the best. They look very very close to a normal bicycle card. You can put one in a normal deck and spectators won't notice the difference if they don't know what to look for. And finally i bought two and expected one of each color as penguin people say it could be done before hand, and then they didn't let me cancel my order when they stated that they only have red backs and send it after my multiple complaints! Those who own the Xpert have been desiring such a Bicycle brand card. Now cards effects done with the Xpert without having to carry or switch to some off brand deck is possible! Already used bicycle Prestige decks for a little while, but I purchased these specifically for Laura London's excellent Card in Bottle.